My youngest didn't want to eat. Nothing on his plate appealed to him and his tantrum was making it known. How could he NOT want to eat a delicious peppercorn-crusted pork loin with stuffing and a mixed vegetable medley? I couldn't wait! Then again, I'm not a 4-year old that had to put down my +LeapFrog LeapPad to eat it either. AM I RIGHT?!! That's sarcasm, folks. Welcome to the show. Anyway, trying to get him to eat dinner... He finally calms down long enough to tolerate his presence at the dinner table and after sampling the pork loin and deciding it was too spicy moved on to "hating the carrots!" I mean HATE the carrots! Forget the broccoli, we're not even there yet! Momma calms him down enough to suffer through the applesauce and just that quick we're back to carrots. I went with the reverse psychology bit.. "Don't you eat those carrots, you'd better not!" Who knew? It worked! Well, it worked for one fork-full anyway. It was mom's coaxing and helpful input that sealed the deal. "Eating carrots helps you see in the dark" she said. While it's not a total lie he began to devour them by the fork-full. Not quite done I asked him to eat the one zucchini on his plate. 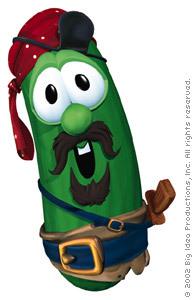 That was met with the resistance of a POW until his sister told him it was a cucumber and said "you're eating Larry!" from +VeggieTales. Gone.... you couldn't have timed it it was gone so quick. Now what? Yup, the broccoli. I have heard tales of other parents that say their children would rather eat their own boogers before consuming broccoli not smothered in ranch dressing, if at all. Try this... "Hey bud, you know what broccoli is really good for? It makes your farts smell terrible." You'd think he found a $50 bill under his seat, and knew the value of it. He looked at one of the stalks now cold and wilting on his plate, stabs it with his fork, and proceeds to down it like a champ. What's next? How about he no-joke lifted his leg and farts at the table. "Ooh, you're right, daddy! They ARE stinky!" He consumes the remaining stalks, farting after every bite, and makes it to the last one before exclaiming, "Almost peed on that one. Better finish this before I fart again... don't want to pee." 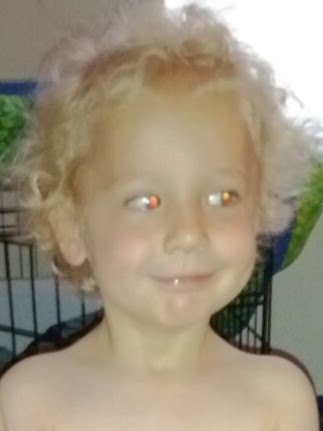 Yes, my son ate every vegetable on his plate to the promise of having night-vision, consuming a cartoon super-hero, and possessing terrible gas. All of which were met, as promised. Was it a bit unorthodox? You bet. Inappropriate? Perhaps. But it worked and I'm satisfied with that. Now we just have to make sure he doesn't eat vegetables at a friend's house or he'll be sorely embarrassed.